Add texture and style to your paper and cardstock projects with Darice's embossing folders! These border folders each measure 5-3/4x1-3/8 inches and will fit most embossing machines. Each package contains three border folders. Available in a variety of designs: each sold separately. Includes "Thinking Of You", "Congratulations", and "Thank You". Put this design border embossing folder to work in your handmade card projects. The open center space in this 4.25" wide by 5.75" high tool gives you plenty of room to inscribe personalized sentiments. Delicate eyelet edging has always been a popular choice as a finishing touch to any hand-stitched project, and with the Eyelet Border Basics Die, that time honored tradition can now continue into your handmade paper craft creations! Dainty, elegant and perfect for adding a touch of old fashioned charm, the delightful borders within this lovely assembling of eyelet border dies provides you with an assortment of pretty finishing touches for decorative card bases, matting for scrapbook layouts, and has also been designed to coordinate with the interactive Foldout Card bases as well! Approximate Image Sizes: 1. Eyelet Border 1: 7.25" x 1.75", 2. Eyelet Border 2: 7.25" x 0.25", 3. Eyelet Border 3: 7.25" x 0.25", 4. Eyelet Border 4: 7.25" x 0.25" 5. Eyelet Border 5: 7.25" x 0.25", 6. Eyelet Border 6: 7.25" x 1.75". Penny Black craft die featuring a border of leaves. Add a fashionable border of leaves to paper projects with this 4.25" wide by 5.75" high embossing folder. Pair it with compatible embossing machines to imprint its delicate texture on greeting cards, photo frames, and scrapbook pages. Craft die from Memory Box featuring a border with leaves. 5.5 x 0.7 inch. Memory Box craft die featuring a border with hearts. 5.3 x 0.4 inch. Craft die featuring a border with circles. 5.6 x 0.6 inch. Craft die featuring a border with hexagons. 5.6 x 0.8 inch. 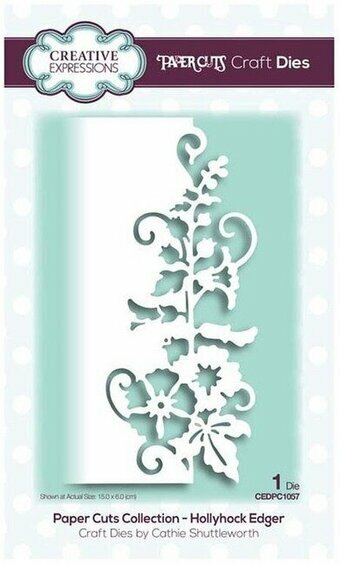 This 8" x 1.25" Embossing Folder is called Delicate Lace Border. Compatible with most leading brand die cutting and embossing machines. 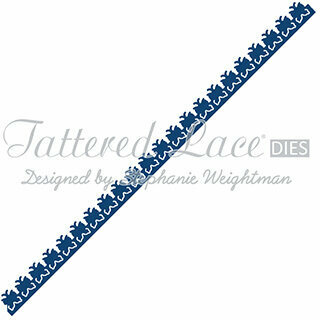 Tattered Lace Die - Butterfly Border. Detailed and delicate, Tattered Lace Dies are the most intricate dies available. This border die is perfect for use in parchment crafting, and gives you the perfect finishing touch to all of your projects whether you are framing your pictures for a sophisticated finish or adding detail with an intricate border. This die measures approx 21cm x 1.1cm. (8 1/4" x 7/16"). Tattered Lace Die - Small Zig Zag Border. Detailed and delicate, Tattered Lace Dies are the most intricate dies available. This border die is perfect for use in parchment crafting, and gives you the perfect finishing touch to all of your projects whether you are framing your pictures for a sophisticated finish or adding detail with an intricate border. This die measures approx 21cm x 0.4cm. (8 1/4" x 3/16"). Impression Obsession craft die featuring a Vine Border. This is a single die measuring approximately 3/4 x 4 inches. Craft die featuring a frame with an intricate border. Pretty and innovative cutting dies to help you create beautiful cards, scrapbook pages and other handcrafted projects! Can be used with most die cutting machines. 3 Elegant borders for playful effects. Includes 3 dies. Size: 3.15 x 5.91, 2.48 x 5.91, 3.42 x 5.90 inches. Crafty-Ann craft die featuring a decorative border. Size: 8" x 1" (205mm x 25mm). This 5" x 7" Embossing Folder features a border of flowers. Compatible with most leading brand die cutting and embossing machines. Congratulations Border is a cute sentiment to have handy for graduations, baby showers, weddings, or other occasions. It's delicate shape makes it easy to curve, giving you more creative options to explore! Lawn Cuts custom craft dies are high-quality steel, made in the USA, and are compatible with most die cutting machines! Approximate size: 5 3/4" x 3/4". Made with care in the USA! This CottageCutz die features Victorian Corners. CottageCutz are thin metal dies, like a QuicKutz. They are easy-to-use and add great detail to any craft project. This die is compatible with the following machines: QuicKutz Squeeze, Revolution, Sizzix / Ellison Big Shot, BigKick, CuttleBug, SpellBinder Wizard and Accucut Zip'eMate. Adapters/shim may be required on some machines. Made in the USA. 100% lead free. Craft die featuring a border with flowers. 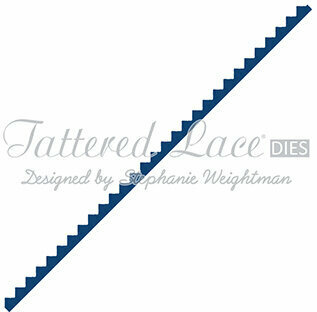 The two-piece Rolling Hills Die-namics will create both a die-cut fence as well as matching rolling hills. The edge-only design of both elements means you can create hills of any height. A bucolic country scene is just seconds away with this handy duo. This 2 piece set includes: Fence 6" x 3/8", Hills 6". MFT Die-namics dies are our very own EXCLUSIVE, American made line of steel dies. Die-namics dies work with most tabletop die cutting machines such as the Big Shot & Cuttlebug. The border measures 1" x 6" long. This die is designed by Dina Kowal, dkdesigns. These dies are compatible with most tabletop die cut machines. Additional shims may be necessary and some machines handle the detail level better than others. Craft dies featuring a border of flowers. Compatible with most die-cutting machines. Lawn Cuts custom craft dies are high-quality steel, made in the USA, and are compatible with most die cutting machines! This cute border of trees is a great way to add some dimension to your crafts! Approximate die sizes: 6" x 1 1/8". Made with care in the USA! Lawn Cuts custom craft dies are high-quality steel, made in the USA, and are compatible with most die cutting machines! The grass is always greener with this cute craft die! Border is 6 inches in length. Approximate die size: 6"W x 5/8"H.
This "happy anniversary" sentiment is a simple and cute way to wish someone a happy anniversary! Its delicate shape gives you lots of flexibility when adding it to cards and crafts. Approximate length: 5 3/4" x 5/8". This "happy birthday" sentiment is a simple and cute way to wish someone a happy birthday! Its delicate shape gives you lots of flexibility when adding it to cards and crafts. Lawn Cuts custom craft dies are high-quality steel, made in the USA, and are compatible with most die cutting machines! Approximate size: 5 3/4" x 7/8". Made with care in the USA! Add a hint of regal and majestic grandeur to your next creation with the swirling and intricate patterns of the Regal Borders and Pockets Die. These die cuts are excellent to use as borders, tag toppers or as pockets which add an interactive element to an heirloom album, one of a kind card, or scrapbook layout. The options and versatility are almost endless...choose to use a single die cut itself, pair it with the coordinating background cut or even use single pieces to create dramatic, fanciful border cuts. This elegant and timeless assembly of dies is one that you will reach for over and over again in the years to come. This die is part of the 3D Flip Fold Album Collection. Ornate Regal Die A: 5.5" x 1.25", Ornate Regal Outline Dies A: 5.75" x 0.15" each, Scalloped Background/Border Die B: 6.25" x 0.25", 6.0" x 0.25", Swirling Regal Die C: 1.5" x 5.75", Swirling Regal Background Border Dies C: 6.0" x 0.15" each. These two dies will be endlessly useful for so many projects! Add a decorative border to your shapes with these small edge dies. 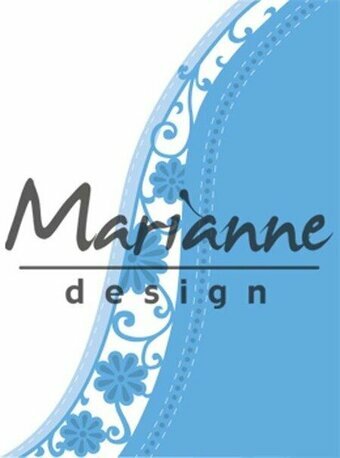 This die is a sophisticated lace border, with a great length for making cards. Includes 1 pcs; 2.5 x 6 in. This little picket fence border is perfect for creating a scene. It's great for a farmyard scene, a grassy field, or even a spooky halloween card. Coordinating set ideas: Use Slide on Over, Road Border, and Bicycle Built for You to create an interactive card with a bicycle traveling along a picket-fence lined road. Use Picket Fence Border to put a large fence in the foreground, and a small fence in the background.